جوناثان جاكسن (بالإنجليزية: Jonathan Jackson) ممثل أمريكي من مواليد 11 مايو 1982. ^ Ellis، Rick (September 3, 1999). "4th Annual YoungStar Award Nominations". AllYourEntertainment, Inc. www.allyourtv.com. تمت أرشفته من الأصل في August 1, 2009. اطلع عليه بتاريخ February 2, 2013. ^ Masters، Megan (February 23, 2012). 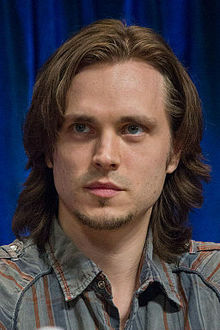 "Pilot Scoop: GH's Jonathan Jackson Heads to Nashville, Mena Suvari Joins NBC Comedy". TV Line. tvline.com. اطلع عليه بتاريخ January 19, 2013. ^ Fundraiser includes actor's memorabilia – News. Norfolk Daily News (November 1, 2012). Retrieved on 2016-04-27. آخر تعديل لهذه الصفحة كان يوم 2 فبراير 2019، الساعة 00:08.